London and North Eastern Railway locomotive numbered 4468 Mallard is a Class A4 4-6-2 Pacific steam locomotive built at Doncaster Works, England in 1938. It is historically significant as the holder of the world speed record for steam locomotives at 126 mph (203 km/h). The A4 class was designed by Nigel Gresley to power high-speed streamlined trains. The wind-tunnel-tested, aerodynamic body and high power allowed the class to reach speeds of over 100 miles per hour (160 km/h), although in everyday service it rarely attained this speed. 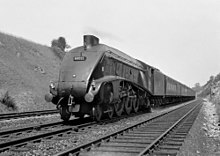 While in British Railways days regular steam-hauled rail services in the UK were officially limited to a 90 mph 'line speed', pre-war, the A4s had to run significantly above 90 mph just to keep schedule on trains such as the Silver Jubilee and The Coronation, with the engines reaching 100 mph on many occasions. Mallard covered almost one and a half million miles (2.4 million km) before it was retired in 1963. The locomotive is 70 ft (21 m) long and weighs 165 tons, including the tender. It is painted LNER garter blue with red wheels and steel rims. Mallard is now part of the National Collection at the United Kingdom's National Railway Museum in York. Mallard is the holder of the world speed record for steam locomotives at 126 mph (203 km/h). The record was achieved on 3 July 1938 on the slight downward grade of Stoke Bank south of Grantham on the East Coast Main Line, and the highest speed was recorded at milepost 90¼, between Little Bytham and Essendine. It broke the 1936 German (DRG Class 05) 002's record of 124.5 mph (200.4 km/h). The record attempt was carried out during the trials of a new quick-acting brake (the Westinghouse "QSA" brake). Mallard was a very good vehicle for such an endeavour. The A4 class was designed for sustained 100+ mph (160+ km/h) running, and Mallard was one of a few of the class that were built with a double chimney and double Kylchap blastpipe, which made for improved draughting and better exhaust flow at speed. (The remainder of the class were retro-fitted in the late 1950s.) The A4's three-cylinder design made for stability at speed, and the large 6 ft 8 in (2.03 m) driving wheels meant that the maximum revolutions per minute (529.4/min at 126 mph) was within the capabilities of the technology of the day. Mallard was four months old, meaning that it was sufficiently broken-in to run freely, but not overly worn. Selected to crew the locomotive on its record attempt were driver Joseph Duddington (a man renowned within the LNER for taking calculated risks) and fireman Thomas Bray. Duddington, then aged 61, climbed into the cab, turned his cap around (as had George Formby in the contemporary film No Limit), and drove Mallard into the history books. He had 27 years on the footplate, and had once driven the Scarborough Flyer for 144 miles at over 74 mph (average speed), considered at the time to be the highest speed ever maintained by steam in the UK. The A4 class had previously had problems with the big end bearing for the middle cylinder, so the big end was fitted with a "stink bomb" of aniseed oil which would be released if the bearing overheated. Shortly after attaining the record speed, the middle big end did overheat and Mallard reduced speed, running at 70–75 miles an hour onwards to Peterborough. It then travelled to Doncaster for repair. This had been foreseen by the publicity department, who had many pictures taken for the press, in case Mallard did not make it back to Kings Cross. The (Edwardian period) Ivatt Atlantic that replaced Mallard at Peterborough was only just in sight when the head of publicity started handing out the pictures. Stoke Bank has a gradient of between 1:178 and 1:200. Mallard, pulling a dynamometer car and six coaches, topped Stoke Summit at 75 mph (121 km/h) and accelerated downhill. The speeds at the end of each mile (1.6 km) from the summit were recorded as: 87½, 96½, 104, 107, 111½, 116 and 119 mph (141, 155, 167, 172, 179, 187 and 192 km/h); half-mile (800 m) readings after that gave 120¾, 122½, 123, 124¼ and finally 125 mph (194, 197, 198, 200 and 201 km/h). The speed recorded by instruments in the dynamometer car, marks were made every half second on a paper roll moving 24 inches for every mile travelled. Speeds could be calculated by measuring the distance between the timing marks. Immediately after the run staff in the dynamometer car calculated the speed over five second intervals, finding a maximum of 125 mph. 126 mph was seen for a single second but Gresley would not accept this as a reliable measurement and 125 miles an hour was the figure published. Ten years later, at the time of the 1948 Locomotive Exchanges, plaques were fixed to the sides of the locomotive, these stated 126 miles an hour, which has been the speed generally accepted ever since. Some writers have commented on the implausibility of the rapid changes in speed . A recent analysis has claimed that the paper roll in the dynamometer car was not moving at a constant rate and the peaks and troughs in the speed curve were just a result of this, the maximum speed being a sustained 124 mph for almost a mile. On arrival at King's Cross (just after the run), driver Joe Duddington and inspector Sid Jenkins were quoted as saying that they thought a speed of 130 mph would have been possible if the train had not had to slow for the junctions at Essendine. In addition, at the time of the run there was a permanent way restriction to 15 mph just north of Grantham which slowed the train as they sought to build up maximum speed before reaching the high-speed downhill section just beyond Stoke tunnel. On 3 July 2013, Mallard celebrated 75 years since achieving the world speed record, and to help commemorate this date all six surviving Class A4 locomotives were brought together around the turntable in the Great Hall of the National Railway Museum at York for a two-week 'great gathering'. The visitors include three UK-based, privately owned engines in 4464 Bittern, 60007 Sir Nigel Gresley and 60009 Union of South Africa (formerly Osprey). Mallard's two internationally based sisters, 60008 Dwight D. Eisenhower and 60010 Dominion of Canada, were present after completing extensive transatlantic journeys, and undergoing cosmetic restoration at the NRM's workshops. Mallard's world record has never been officially exceeded by a steam locomotive, though the German Class 05 was at least very close: in 1936, two years before Mallard's run, 05 002 had reached 200.4 km/h (124.5 mph) between Hamburg and Berlin. Stoke Bank is long, straight and slightly downhill, whereas the 1936 run of 05 002 took place on a horizontal stretch of track. Unlike world records for cars and aircraft, there is no requirement for an average of two runs in both directions, and assistance from gradient or wind has always been acceptable in rail speed records. Also, unlike Mallard, 05 002 survived the attempt undamaged: on the other hand, its train was only four coaches long (197 tons), whereas Mallard's train was seven coaches (240 tons). In terms of rival claims, Gresley and the LNER had just one serious attempt at the record, which was far from a perfect run with a 15 mph (24 km/h) permanent way check just North of Grantham. Despite this a record was set. Gresley planned to have another attempt in September 1939, but this was prevented by the outbreak of World War II. Before the record run on 3 July 1938, it was calculated that 130 mph (210 km/h) was possible, and in fact Driver Duddington and LNER Inspector Sid Jenkins both said they might well have achieved this figure had they not had to slow for the Essendine junctions. There are claims that the Milwaukee Road class F7 and PRR S1 locomotives attained service speeds faster than Mallard's record. However, such claims were not officially verified, thus Mallard continues to hold the official record. The LNER A4 and PRR T1 classes had the same piston stroke and driving wheel diameter, which gave both locomotives the same piston speed for the same track speed. Thus, Mallard still officially holds the record; plaques affixed to each side of the locomotive commemorate the feat. The plaques were proposed and designed by Morley headmaster Harry Underwood, a keen steam enthusiast, in 1948. In 1948, shortly after the formation of British Railways, the decision was taken to test locomotives from all of the former 'Big Four' companies to find the best attributes of speed, power and efficiency with coal and water. There were two ways of testing and comparing locomotives: either at the Rugby Locomotive testing plant, which was not ready until late 1948 or by testing in the field itself. The results of these trials would be used to help design the British Railways Standard locomotives. Three Gresley A4 locomotives were chosen to represent the Eastern Region: E22 Mallard, 60033 Seagull and 60034 Lord Faringdon. All of the locomotives had the Kylchap double blastpipe chimney arrangement and were fresh from Doncaster works. Mallard had emerged from Doncaster with a fresh coat of post-war garter blue livery, stainless steel numbers 22 with a small 'E' painted above them (for Eastern region), new boiler (its fourth) and third tender of its career. E22 Mallard was used on 8 June 1948 on the Waterloo-Exeter route. Driver Marrable took the famous A4 with a load of 481 tons tare, 505 tons full, the same that had been used on the previous trip by 35018 British India Line. Mallard reached Clapham Junction in 6 minutes 57 seconds and Woking in 28 minutes 47 seconds. At Hook there were adverse signals, causing Mallard to slow to a crawl. Even so, Salisbury was reached in 108 minutes and 28 seconds. Despite the signals earlier, the train was only 5-and-a-half minutes late. The net time was 95.5 minutes. Mallard failed after this trial and 60033 Seagull took over. On 10 June Seagull achieved the run in 96 minutes 22 seconds, but had departed 3 minutes late, meaning Seagull had arrived with the same load 3.5 minutes early. 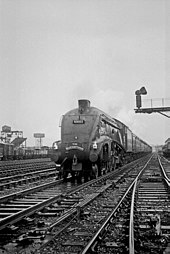 For Mallard, the 1948 Locomotive Exchange Trials were over, but Mallard returned to the Waterloo-Exeter line for a Locomotive Club of Great Britain (LCGB) railtour on 24 February 1963. The "Elizabethan" was a flagship express that ran non-stop over the 393 miles (632 km) between London King's Cross and Edinburgh Waverley from 1953 to the mid-1960s. Until September 1961 it was steam-hauled. In its day it was the longest non-stop run in the world. Two crews were needed for the six-and-a-half-hour run. They were able to change over mid-journey by using a corridor tender. Only a few locomotives other than Mallard had such a tender. The last steam-hauled Elizabethans ran on 8 September 1961, the northbound ("Down" in British railway parlance) train was accompanied by photographers, journalists and performance recorders. Their outputs were uncoordinated and have only come to light over many years. Mallard hauled the train, with sister loco 60009 Union of South Africa hauling the corresponding "Up" train. The journalists wrote a valedictory piece in The Sunday Telegraph of 10 September 1961. This has recently been reproduced in a compendium of railway-related pieces from The Daily Telegraph and The Sunday Telegraph over the years. This names the driver and fireman from Kings Cross to York as Harold Birkett and John Thorne. They were replaced north of York by driver Bob Currie and fireman Alec Mackay. Chief Motive Power Inspector Bert Dixon stayed on the footplate for the whole trip. The photographers appear to have been from British Railway's own photography unit. Some of the photographs of the trip have survived in the "Liverpool Street Collection" at the National Railway Museum. Four of them were reproduced in a minority publication in 1971, one of them – showing Driver Birkett using the corridor tender – has been used in magazines since. Triangulation occurred in Railway Magazine in 2013 when a log of the run was published, with narrative, taken from Railway Performance Society's archives. The original log was compiled by Mr C. Hudson. The train arrived three minutes early after a run involving several speed checks and was interpreted as a credit to men, system and machine. Mallard was released into traffic for the first time on 3 March 1938. It was the first A4 to be fitted with a Kylchap double blast pipe from new. This was one of the factors that led to its selection for the attempt on the world rail speed record in July of that year. Mallard wore a variety of liveries throughout its career. These were: garter blue as 4468, LNER wartime black from 13 June 1942, later wartime black with the tender marked as "NE" from 21 October 1943 as 22 with yellow small stencilled numbers, post-war garter blue with white and red lining from 5 March 1948 with stainless steel cabside number 22, British railways dark blue as 60022 from 16 September 1949, Brunswick green from 4 July 1952 and its original LNER garter blue for preservation in 1963. The A4 class was built with streamlined valances, or side skirting, but this was removed during the war to ease maintenance. Mallard lost its valances during a works visit 13 June 1942, regaining them in preservation in 1963. Mallard was fitted with twelve boilers during its 25-year career. These boilers were: 9024 (from construction), 8959 (from 4496 Golden Shuttle, 13 June 1942), 8907 (from 2511 Silver King, 1 August 1946), 8948 (from 31 Golden Plover, Walter K Whigham, 10 January 1951), 29301 (from 60019 Bittern, 4 July 1952), 29315 (from 60014 Silver Link, 23 April 1954), 29328 (new-build boiler, 7 June 1957), 29308 (from 60008 Dwight D. Eisenhower, 27 August 1958), 29310 (from 60009 Union of South Africa, 9 March 1960) and 27965 (from 60009 Union of South Africa, 10 August 1961). Mallard has had seven tenders throughout its career. It started off with a non-corridor tender in 1938, had corridor design tenders during its British Railways days and was fitted with a non-corridor tender in 1963 to recreate its original appearance. The tenders it has been fitted with are: 5642 (3 March 1938 – 14 March 1939), 5639 (5 May 1939 – 16 January 1948), 5323 (5 March 1948 – 12 March 1953), 5648 (12 March 1953 – 21 July 1958), 5330 (27 August 1958 – 30 May 1962), 5651 (30 May 1962 – 25 April 1963) and 5670 (current tender, masquerading as original tender 5642). The original non-corridor tender 5642 was later coupled to sister locomotive 60026 Miles Beevor when it was withdrawn on 21 December 1965 but later came into the possession of the A4 Preservation Society who had purchased this locomotive from the scrapyard to assist the restoration of classmate 4498 Sir Nigel Gresley. It was scrapped in 1973 as being surplus to requirements, by which time it had also donated parts to the restoration of A3 class locomotive 4472 Flying Scotsman, which had recently returned from America and was being restored at Derby Workshops. Mallard was allocated to three sheds during its career: Doncaster, transferring on 21 October 1943 to Grantham and on 11 April 1948 to Kings Cross Top Shed. Two A4s were exported after retirement, one to the USA (No. 60008 (LNER No. 4496) Dwight D. Eisenhower) and the other to Canada (No. 60010 (LNER No. 4489) Dominion of Canada). In October 2012, they came back to prepare for the 75th anniversary celebrations in 2013 of the record run. They and Mallard were joined at the National Railway Museum by No. 4464 (BR. No. 60019) Bittern, No. 60007 (LNER No. 4498) Sir Nigel Gresley and No. 60009 (LNER No. 4488, formerly Osprey) Union of South Africa. No. 60008 had its BR Brunswick Green livery refreshed and No. 60010 was re-painted in LNER Garter Blue with stainless steel lettering and number 4489 and fitted with the Canadian bell and whistle. In early 2014, the six A4s were displayed at the National Railway Museum Shildon, which was the final exhibition of the six engines together. In March 2014, the Mallard returned to York, and the 4464, 60007, and 60009 all returned to their owners. 60008 and 4489 remained at Shildon until April, and were returned respectively to the US and Canada from April–June 2014. On the weekend of 5 July 2008, Mallard was taken outside for the first time in years and displayed beside the three other A4s that are resident in the UK, thus reuniting them for the first time since preservation. It departed the museum for Locomotion, the NRM's outbase at Shildon on 23 June 2010, where it was a static exhibit, until it was hauled back to York on 19 July 2011 and put back on display in its original location in the Great Hall. Bachmann and Hornby released models of Mallard several times in Garter Blue. Hornby released a model of Mallard in BR Express Passenger Blue and a limited edition model in BR Dark Loco Green. Hornby has also released a limited edition model of 4468 in LNER form along with the other five surviving A4s in 2013. A Corgi 1:120 scale model in Garter Blue as part of a series entitled "Rail Legends" is available. Hachette Publications have also released an 'O' Gauge 'Build-It-Yourself' model in Partwork format. This series is still current in June 2016. Mallard features in one of the later books in Railway Series by Christopher Awdry: Thomas and the Great Railway Show (with a face on), and is also mentioned in Gordon the High-Speed Engine. Mallard also features in the Peter's Railway book Surprise Goods by Christopher Vine, where she rescues a broken down freight train. A painting of Mallard in her immediate post-war condition features on the 1993 Blur album Modern Life is Rubbish. The painting was a stock image that Stylorouge—Blur's design consultants—obtained from a photo library in Halifax. According to Design Week magazine, the painting "evoked the feel of a Just William schoolboy's pre-war Britain". The 2013 song "East Coast Racer" by British progressive rock band Big Big Train tells the story of Mallard's record-breaking run. On the popular US TV crime drama NCIS, the Hornby model of Mallard is a usual feature in some of the scenes that take place within the autopsy department. The model can usually be seen above the desk at the end of the room, and belongs to Dr. Donald "Ducky" Mallard (played by David McCallum). ^ a b "Mallard 75". National Railway Museum. Archived from the original on 27 August 2016. Retrieved 28 November 2016. ^ Solomon, Brian (2003). Railway Masterpieces. Newton Abbot: David & Charles. p. 28. ISBN 9780715317433. OCLC 52695896. ^ "Men who served on Mallard prepare to be reunited with famous locomotive". ^ Semmens, P.W.B. Speed on the East Coast Main Line. p. 64. ^ Magnificent Mallard: The world's fastest steam locomotive. 2 July 2013. Event occurs at 02:49. Archived from the original on 26 December 2018. Retrieved 21 July 2018. ^ "Railway Vehicle Information Sheet – 1975–7007 – Mallard" (PDF). National Railway Museum Official Website (PDF File). York England: National Railway Museum. p. Pg. 3. Archived (PDF) from the original on 31 October 2017. Retrieved 9 May 2017. ^ West Riding Small Locomotive Society journal, March 1948: "Harry Underwood is recorded as being the instigator of the idea (via the C.M.E. Doncaster) of fitting 'Mallard' with commemorative plaques. Photo of plaque design sent to him from Doncaster for his approval." ^ Merritt 2015, p. 32. ^ Kerr 2009, pp. 265–8. ^ Doherty 1971, pp. 18, 19 & 54. ^ Farr 2013, pp. 18 & 19. ^ Austin, Jane. "Blurred Vision – Covers of Albums and CDs". Design Week. 2 September 1994. ^ "How Mallard inspired a rock band". National Railway Museum. 23 May 2013. Archived from the original on 8 September 2013. Retrieved 2 July 2013. ^ "on Model Trains and TV characters – 2011". Raymond G. Potter – Scale Models, Arts, & Technologies, Inc. February 2012. Archived from the original on 7 October 2013. Retrieved 5 October 2013. Allen, Cecil J. (1949). The Locomotive Exchanges 1870 – 1948. Ian Allan Ltd. A comprehensive book on locomotive exchanges, giving details of each trial and the locomotives involved. Boddy, M.G. ; Neve, E.; Yeadon, W.B. (April 1973). Fry, E.V. (ed.). Part 2A: Tender Engines – Classes A1 to A10. Locomotives of the L.N.E.R. Kenilworth: RCTS. ISBN 0-901115-25-8. Hale, Don (2005). Mallard: How the 'Blue Streak' Broke the World Steam Speed Record. London: Aurum Press. ISBN 1854109391. Merritt, A (7 September 2015). "Letter to the Editor". The Times. London. LNER Class A4 4468 Mallard.